Throughout the two-thousand-year span of Christian history, believers in Jesus have sought to articulate their faith and their understanding of how God works in the world. How do we, as we examine the vast and varied output of those who came before us, understand the unity and the diversity of their thinking? How do we make sense of our own thought in light of theirs? The Christian Understandings series offers to help. 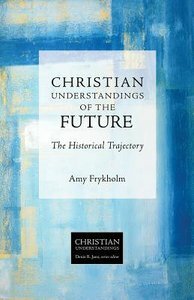 In this crisp and engaging volume Amy Frykholm offers a tour through more than two millennia of Christian thought on the future. Starting with the contexts of the Hebrew Bible and moving forward, Frykholm outlines the enduring fascination believers have had with future events and the myriad ways they have articulated their beliefs about what the future holds. From the imperial contexts of the book of Revelation to the end times prophecy of Harold Camping, Frykholm presents a thoughtful and insightful tour. About "The Future - the Historical Trajectory (Christian Understandings Series)"